How Do You Use Windows XP Safely Since It's No Longer Supported? Windows XP is now obsolete. Support for it ended on 8 April 2014. Therefore, this implies no more security updates or patches or technical support for the OS. Which, in turn, implies Windows XP is no longer safe – unless protected by the right kind of security software. Now the question is: what kind of security software would best protect Windows XP users? Not many antiviruses are available for free for Windows XP in the security market, since it is now obsolete. Antivirus makers are more concerned with protecting the latest version – the Windows 10. But we, at Comodo, very well understand the needs of Windows XP users and also their reluctance to move away from the OS which they have gotten used to over the years. With this in mind, we designed Comodo Free Antivirus XP. 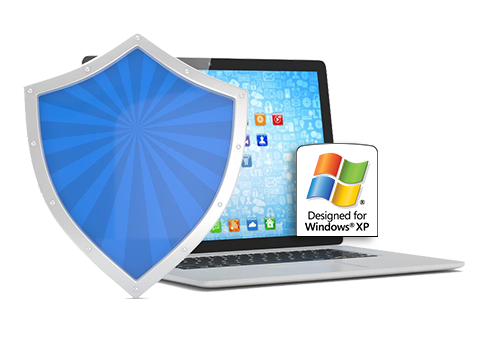 But First, What Do You Need To Protect Windows XP? Default-Deny Protection: a technology unique to Comodo which, as the name suggests, denies entry to applications by default, and provides entry only when these applications prove themselves to be benign. Containment Technology: that 'contains' unknown applications and runs them in a separate environment so that they don't harm your PC(s). Host Intrusion Prevention System (HIPS): which scans your PC(s) (applications and processes running in it) and alerts you when suspicious activity is detected. Website Filtering: that protects PC users from phishing websites by employing effective website screening process and by allowing them to customize internet access rules for every user of the PC. Cloud-Based Protection: which ensures complete PC protection even when the system is not updated with the latest antivirus definitions. Secure Shopping: which ensures PC users like you can shop online without fear of any security attacks. All this and more are available with Comodo Free Antivirus XP. Malware Removal Service: to ensure your malware-infected PC(s) are disinfected properly and using the right tools. Secure Wireless Internet: since the number of security exploits associated with Windows XP is huge, it's better for Windows XP users to protect their wireless internet using TrustConnect. Cloud-Backup: to ensure your PC data is properly backed up and retrieved in the case of worst-case scenarios. 24/7 Available Support: that guarantees assistance is always in the standby mode in case of any difficulties.